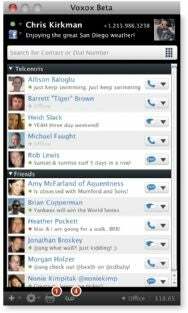 A couple of years ago, phone company TelCentris came out with VoxOx—a “Universal Communicator Service” that provided a single software interface to e-mail, chat, social networking, phone, and fax. It was a powerful tool, but the software interface wasn’t as clear as it could be. Now TelCentris has now announced a new version of the software which completely revamps that interface. The list of things that VoxOx can do is pretty overwhelming: You can use it to chat via AIM, ICQ, GoogleTalk, and Yahoo Messenger. It can serve as an interface to Facebook and Twitter. It’s an e-mail client. It will let you share files (even large ones) via e-mail, IM and text messaging. You can sign up for a free phone number with VoxOx, then use that number to manage multiple phones a la Google Voice. The phone service supports conference calls, call forwarding, and call screening. You can even use the software to send and receive faxes. The key to unifying all that is the contact list: Once you’ve added your contacts—and their e-mail addresses, phone numbers, and other contact details—you can use VoxOx to communicate with them in whatever way you like. You select someone on your list, then click on the phone number, e-mail address, social networking service, or whatever other communciations medium you want to use, and VoxOx will make the connection. In the previous version of the software, all those various tools were split among multiple windows, and those windows weren’t especially friendly. The new version puts everything in one window, and it’s considerably easier to work with. It looks much like iChat: Conversations with a given contact are threaded, regardless of the medium you’re using. Even if you switch from IM to texting in mid-conversation (if, say, the other person is on the move from his desk to his car), the whole conversation stays in that one interface. The VoxOx software is free; the company makes its money providing VoIP and texting services. An unlimited calling plan covering the U.S. and Canada, for example, costs $2.45 per month; a worldwide plan starts at $12.95. (That covers calls to landlines and cell phones; phone calls with other VoxOx customers are free.) Texting plans are extra.